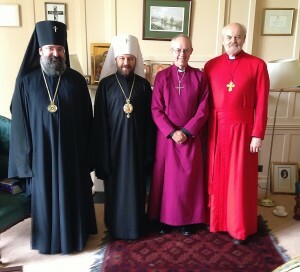 On 25 September 2013, at the invitation of the Archbishop of Canterbury, Justin Welby, Metropolitan Hilarion of Volokolamsk, chairman of the Moscow Patriarchate’s Department for External Church Relations, and Arcbishop Elisey of Sourozh attended the episcopal ordination of Canon Jonathan Goodall which took place in the main Cathedral of Westminster Abbey. Canon J. Goodall worked as the Ecumenical Secretary of the Archbishop of Canterbury for many years. Among those present at the ceremony were Archbishop Gregory of Thyateira and Great Britain (Patriarchate of Constantinople), Metropolitan Iosif of Southern and Western Europe (Romanian Orthodox Church), hierarchs and clergy of the Local Orthodox Churches and Oriental Churches, and the Apostolic Nuncio to Great Britain, Archbishop Antonio Mennini. After the ceremony, the guests proceeded to the Lambeth Palace where a solemn reception was given on behalf of the Archbishop of Canterbury. During the reception, Metropolitan Hilarion had a talk with Dr Geoffrey Rowell, the Bishop of Gibraltar in Europe. They discussed a number of topical issues of inter-Christian relations, as well as the prospects in students exchange between theological educational institutions. Metropolitan Hilarion also had talks with the former Archbishop of Canterbury, Dr. Rowan Williams, and with the Bishop of London, Dr. Richard Chartres. That same day, the DECR chairman met with the Archbsihop of Canterbury Justin Welby at the Lambeth Palace. The participants in the meeting discussed the current state of inter-Christian relations and of the Orthodox-Anglican dialogue, as well as the prospects for further cooperation between the theological schools of the Russian Orthodox Church and the theological educational institutions of Great Britain. Metropolitan Hilarion conveyed to the Archbishop of Canterbury an invitation to send students and groups of pilgrims to Russia so that they could learn more about the Russian Orthodox spirituality and the life of the Russian Orthodox Church. The Anglican bishops who took part in the meeting spoke about the great importance of the heroic deed of the holy new martyrs and confessors of the Russian Church for the whole Christendom. Metropolitan Hilarion and Archbishop Justin Welby discussed the situation in Syria and the Middle East. The DECR chairman informed the Archbishop of Canterbuty of the efforts that the Russian Orthodox Church has been making to defend Christians in the Middle East region. Taking part in the meeting were also Archbishop Elisey of Sourozh; Dr. Richard Chartres, Bishop of London; Hieromonk Ioann (Kopeikin), assistant to the DECR chairman; and the Rev. Alexander Vasiutin, a DECR staff member. At the end of the meeting, Metropolitan Hilarion presented Archbishop Justin Welby with the English edition of his two-volume book “The Orthodoxy”.